Fellowship Previews: Valiant Teams With ComicsPRO to Bring WRATH OF THE ETERNAL WARRIOR and BOOK OF DEATH to Local Comic Shop Day! Valiant Teams With ComicsPRO to Bring WRATH OF THE ETERNAL WARRIOR and BOOK OF DEATH to Local Comic Shop Day! Valiant Entertainment is proud to announce that it is partnering with ComicsPRO for Local Comic Shop Day, a brand-new event celebrating comic book shops and their important contributions to the comic book industry. On Saturday, November 28th, head to your local comics retailer for two exclusive Valiant offerings – WRATH OF THE ETERNAL WARRIOR #1 and BOOK OF DEATH: THE FALL OF HARBINGER #1 LCSD Exclusive Variants – available only at participating Local Comic Shop Dayretailers! 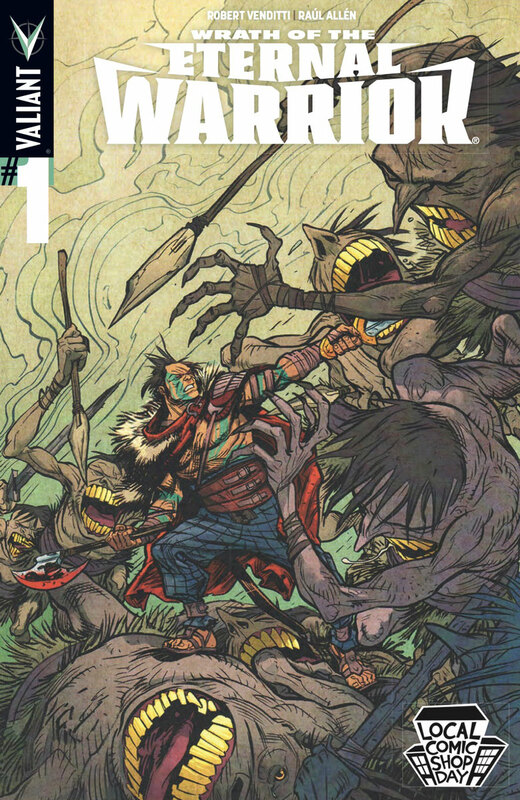 First, Local Comic Shop Day begins with the WRATH OF THE ETERNAL WARRIOR #1 LCSD Exclusive Variant – kicking off Valiant's biggest series launch of the fall with an all-new, never-before-seen cover by acclaimed artist Tom Fowler (QUANTUM AND WOODY, Venom)! This November, the Valiant Universe forges a major new milestone as Earth’s Fist and Steel embarks on a daring crusade to the far end of existence with WRATH OF THE ETERNAL WARRIOR #1 Exclusive Variant – the FIRST ISSUE of a new ongoing series by New York Times best-selling writer Robert Venditti(BOOK OF DEATH, X-O MANOWAR) and breakout artist Raul Allen (BLOODSHOT REBORN, Hawkeye)! 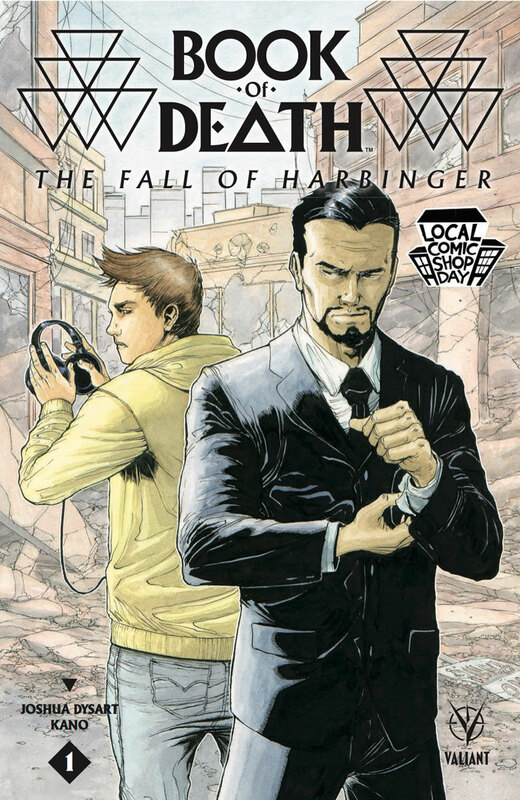 Then, Valiant's Local Comic Shop Day celebration continues with the BOOK OF DEATH: THE FALL OF HARBINGER #1 LCSD EXCLUSIVE VARIANT! Featuring a brand-new cover by red-hot rising star Robert Gill (BOOK OF DEATH, Batgirl) and strictly limited to 1,000 copies, Valiant's blockbuster summer event continues here with a glimpse into the future of the Valiant Universe…and the revelation of the long-awaited final reckoning between the world’s two most powerful psiots…Peter Stanchek and Toyo Harada! Join New York Times best-selling writer Joshua Dysart (HARBINGER) and visionary artist Kano (Gotham Central) for a journey to the far end of the Geomancer’s BOOK OF DEATH to reveal the final, unavoidable end for Valiant's most devastating foes in the BOOK OF DEATH: THE FALL OF HARBINGER #1 LCSD Exclusive Variant – available only on Local Comic Shop Day! "Local comic book retailers are the bedrock of the comic book industry and continue to be the single most important means of connecting with fans around the world," said Valiant Publisher Fred Pierce. "It is Valiant's distinct pleasure to join ComicsPRO as an inaugural sponsor of the very first Local Comic Shop Day and to contribute to the continued success of their ongoing and vital mission." Participating retailers will sell exclusive releases from participating publishers. Some items offered will be limited editions, others will be “first day of release” items debuting on LCSD, released on that Saturday – outside of the traditional Wednesday routine. The goal of Local Comic Shop Day is to jump start the holiday buying season for storefront comics specialty retailers while also giving comics fans more of what they most desire.